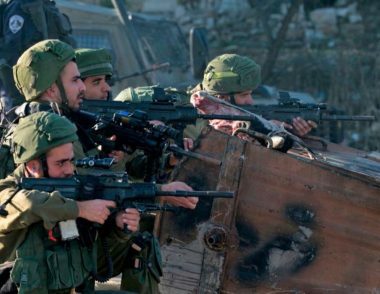 Several Israeli army jeeps invaded, earlier on Thursday morning, Azzoun town, east of the northern West Bank city of Qalqilia, abducted four Palestinians, and caused many to suffer the effects of teargas inhalation. The soldiers attacked many Palestinians, who protested the invasion, and fired live rounds, rubber-coated steel bullets and gas bombs at them, and at many homes and shops. Medical sources said scores of Palestinians suffered the effects of teargas inhalation, especially after the army fired gas bombs at homes. The army also caused serious damage to a local barbershop. Furthermore, the soldiers abducted a wounded former political prisoner, identified as Omar Abu Haniyya, 20, in addition to As’ad Sweidan, 30, Qussai Shaher Salim, 21, and Zakariya Shbeita, 20. In related news, the soldiers abducted four Palestinians, from their homes in Nablus and Hebron, in the northern and southern parts of the occupied West Bank, and invaded stores near Bethlehem before examining surveillance recordings.